From behind its head came two large “feathers” that projected forward…This butterfly has antlers, I thought in awe. Something caught me eye one morning as I approached the outside door leading upstairs to my office. It looked a bit like a dried leaf caught in one of the cracks in the decking. But when I turned to look, I could see it was one of the giant silkmoths perched on the deck, wings upright. I walked over, watched it for a few seconds, then gently picked it up and took it up to the office, safe from the many potential bird predators around the building. I placed it in a plastic container with the intention of releasing it toward sunset. I had a full slate of programs that day so didn’t get back to the moth to observe or photograph it, and assumed it was a male based on a quick glance at the somewhat feathery antenna. 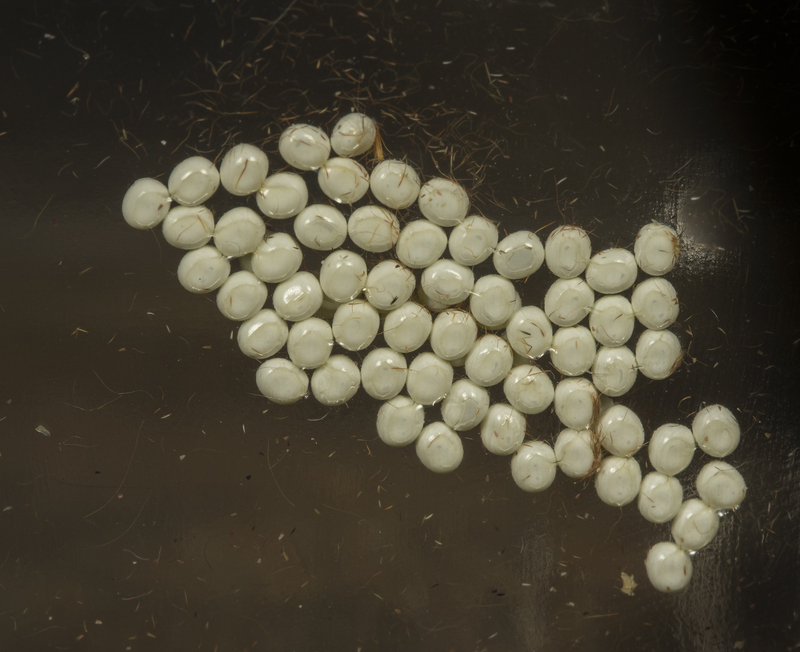 Later, I was surprised to find a cluster of eggs adhering to the walls of the container. Turns out, my moth was a female tuliptree silkmoth, Callosamia angulifera. This is one of many species of giant silkmoth in this area. The group is so-named for their large size (this one has a wingspan of 4 inches) and use of silk in their cocoons. 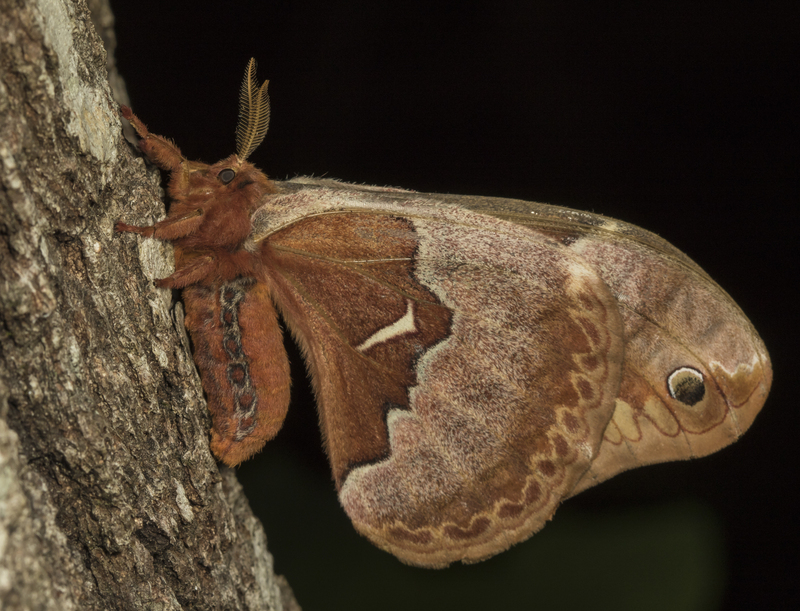 Other local species in this family of moths, the Saturniidae, include the luna, cecropia, and polyphemus moths. 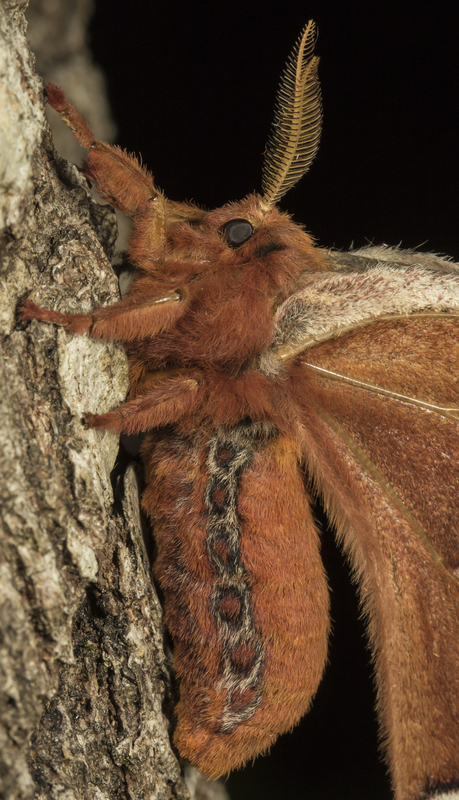 They are all large, beautiful moths, with “furry” bodies and somewhat velvety wings. They do not feed as adults due to under-developed mouthparts, and live only a week or so as adults, with their sole purpose being to mate, lay eggs, and then die. 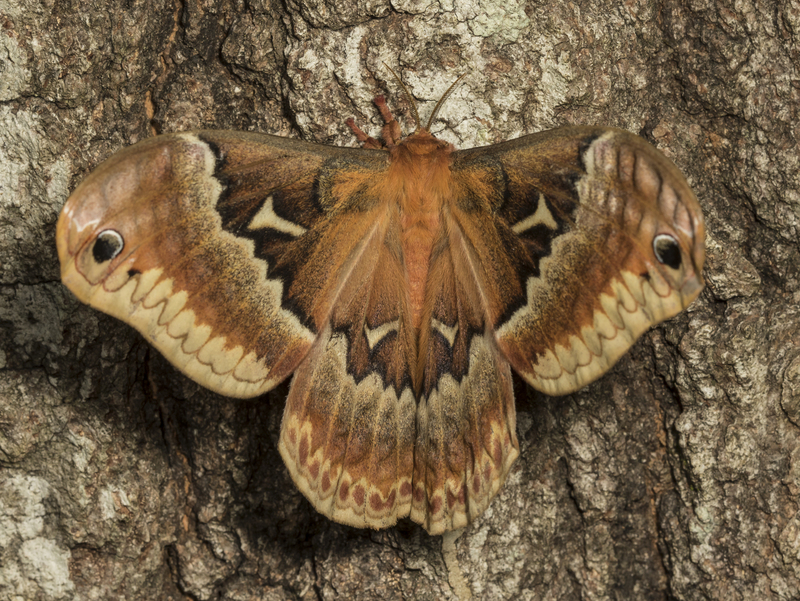 The tuliptree silk moth lays its eggs on leaves of tulip poplar, so I will transfer the eggs to some saplings when they hatch (in about a week). This species is identified by the brown and reddish-brown colors of the adults, and the presence of the angular, T-shaped spots on the wings. Late in the day, I placed the moth on a tree trunk and watched. She began to quiver her beautiful wings, the silkmoth version of revving your engines. This is how they get their body temperature up to a sufficient internal temperature for flight. It didn’t take long before this giant of the night sailed off into the trees. I’ll keep you posted on her eggs and larvae over the coming weeks. 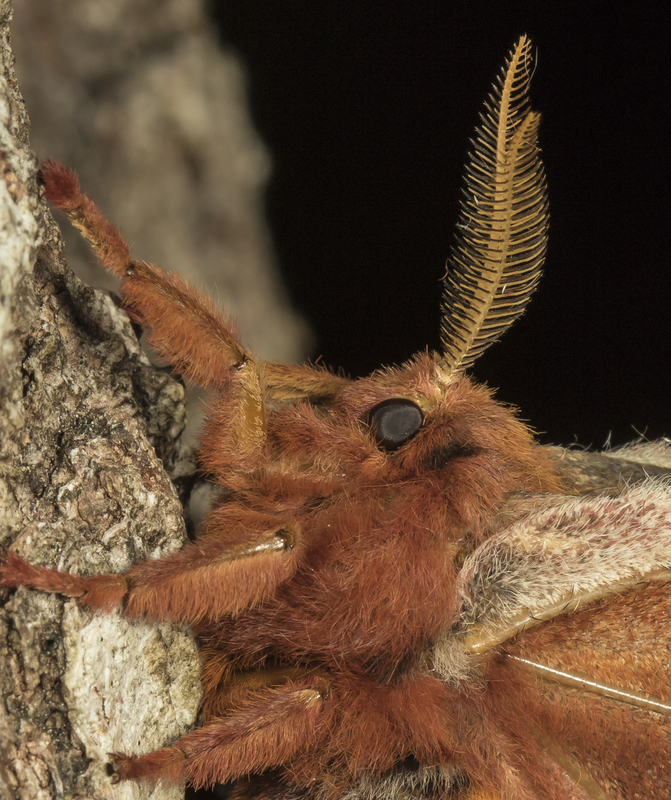 This entry was posted in Natural History and tagged tuliptree silkmoth by roadsendnaturalist. Bookmark the permalink. wonderful documentation of this beautiful moth. Thanks, Mary. A beautiful creature for sure.